La Bota de Palo Cortado 51 “Bota GF” is a stablemate to La Bota de Palo Cortado 41 “Bota NO” and La Bota de Palo Cortado 48 “Bota Punta”, as it has been sourced from another of the butts included in the solera GF-30 kept by Gaspar Florido in its old cellars at Rubiños St, in the very heart of the “Barrio” in Sanlúcar de Barrameda–and later moved to a dilapidated complex on the road to Trebujena which is still in use though no longer as a cellaring facility. Until 2013-2014, these butts have rested at the sacristy of Bodegas Pedro Romero, back to the “Barrio” and in fact very close to their original location. The label legend “Bota GF” is of course our modest tribute to the original wine and its maker until 2007. 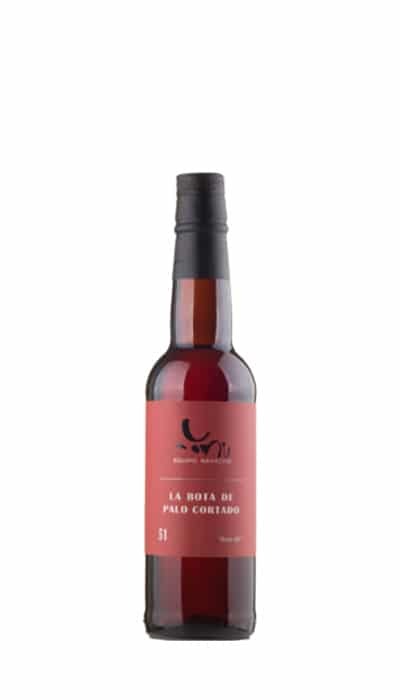 Together with the rest of the releases in this short series, La Bota de Palo Cortado 51 “Bota GF” gives an increasingly rare opportunity to encapsulate and enjoy a little sample of the history of the Sherry district. We are talking about releases 41, 47, 48, 49, and 51: their estimated average ages range from 50–in the case of the youngest–to 80 years. There is simply not that much venerably old wine left around anymore, not to mention as balanced and harmonious as these; not even in the combined cellars of Jerez, El Puerto and Sanlúcar, and we fear that the chances of having access to jewels such as these are unlikely to abound in the future–especially at these prices and in lots of multiple wines of the same breed for us to compare.